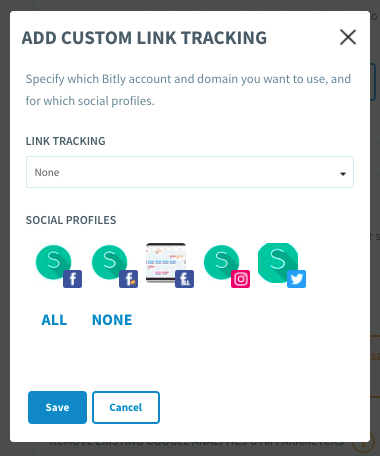 You can connect multiple Bitly accounts to your SmarterQueue account. This way, you can use a separate Bitly account to track clicks for each of your social profiles or change the way your links appear for each of your social profiles. You can manage link tracking in your SmarterQueue Settings. From here, click Add custom link tracking for a social profile. In the “Link Tracking” drop-down menu, select the short link you want to use for these social profiles. 💡To turn link tracking off for these social profiles, select “None” from the drop-down menu. Then, select the profile(s) that you want these settings applied to. Now when you add a link to a post for one of these social profiles, we will default to using your customized settings. In your SmarterQueue Settings, you can choose which Bitly domain to use for each of your social profiles, or turn link tracking on or off on a profile-by-profile basis. If you are managing different brands or clients, they can have their links tracked with their own Bitly accounts. This allows each client to view detailed analytics for just their links in bitly.com’s analytics dashboard. If you are using a custom domain for your Bitly links (e.g. acme.co), you can choose whether to use that custom domain for all your social profiles, none of your profiles or just some of them. 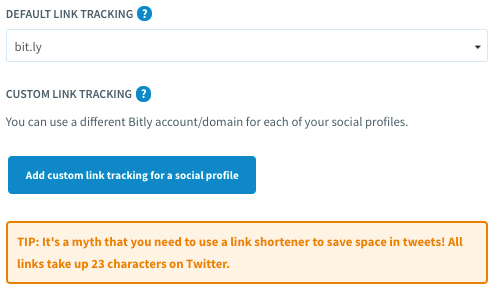 If you want to use your own custom domain for link shortening, you should follow Bitly’s instructions to connect the domain to your Bitly account. Once you’ve done that, and the Bitly account is connected in SmarterQueue, you can choose that custom domain for all links posted through SmarterQueue. As above, you can choose to use your custom domain for just one social profile, a group of social profiles, or all your social profiles. You may notice that some links you shorten will have a different short domain name (e.g. apple.com gets shortened as apple.co, mashable.com gets shortened as on.mash.to). Those websites are using Bitly’s Pro service, where their branded domain name is used whenever anyone shares a link to their website. If you have selected to shorten your links with bit.ly or bitly.com and share a link to a website with a Bitly Pro branded short domain, your link will use the branded short domain. However, if you have selected to shorten your links with j.mp or your own custom domain, your link will not use the website’s branded short domain but will respect your choice.